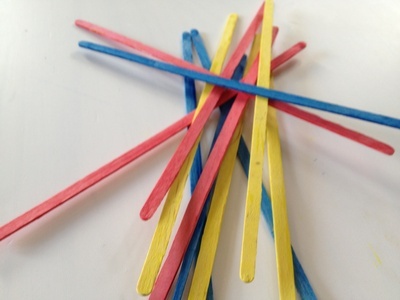 Pick Up Sticks is a game I loved as a child and it has all kinds of names all over the world. It's a game of skill and patience that can be enjoyed as a family. It's really easy to make your own set and would make a fun present to give a sibling. 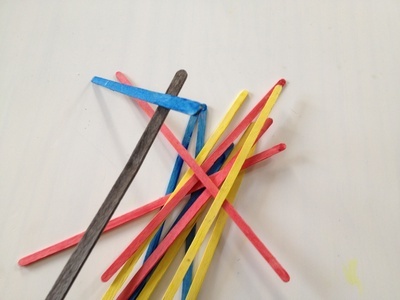 Handful of coffee stirring sticks or wooden skewers. 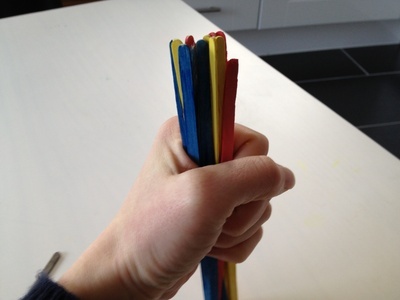 Start by painting the sticks in different colours, with several sticks in each colour. We chose blue, yellow and red. Paint one stick an individual colour as this will be the stick you use to pick up the others. We chose black. Once the sticks are dry, you are ready to play. Hold the sticks in a bunch vertically over a flat surface but keep the black stick separate. Release the sticks and they will fall in a random fashion. Each player takes it in turn to use the black stick to try and pick up another without moving any other sticks. To make the game a little more testing, you can assign different points to different colours of sticks. 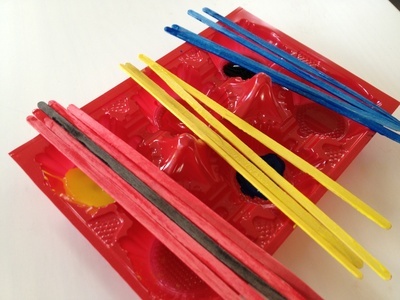 For example, in our game the yellow sticks were worth 5 points, blue 10 points and red 20 points. I have always loved this game.